Dodging a hurricane that struck the mid-Atlantic states, the inaugural Cord Blood Connect international congress won plaudits from attendees, faculty, guests and exhibitors. With more than 330 registered, nearly a third of those attending the congress were internationally based from 33 countries. The 14 cord blood-related organizations collaborating on the congress shared in the success. 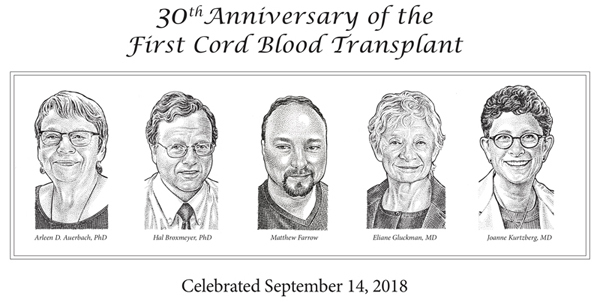 Eliane Gluckman, MD, who performed the world's first successful umbilical cord blood transplant in 1988, received the first CBA Lifetime Achievement award. Presenting the award was Matthew Farrow who, at age 5, was her patient for this cord blood transplant. Everyone at the award presentation and Dr. Gluckman’s keynote lecture received a copy of the lithograph as a personal memento of the event. After the ceremony, scores of congress attendees crowded around the podium for autographs of their illustrations. In another session on the second evening of the congress, all of those involved in that first cord blood transplant reminisced about events leading up to, and their recollections about, the procedure performed 30 years ago at Hôpital Saint-Louis in Paris. Many of the congress presentations are on line, available for streaming on demand. Just because you couldn’t make it to the congress, doesn’t mean you don’t have access to the information. Or maybe you attended the congress in Miami Beach but had to choose between concurrent sessions. You can view the session you missed, or access a presentation that you want to see again. The 20 hours of videos and 31 presentations are “open access,” meaning that they can be viewed free of charge by anyone who attended the congress or not. The CBA Board of Directors allocated funds for the open access to make the congress information widely accessible – consistent with the association’s purpose of advancing cord blood and perinatal tissue therapies and banking. The structure of Cord Blood Connect was unique because of two concurrent tracks, one with scientific sessions including cord blood and cord tissue clinical and pre-clinical investigations, and the other technical sessions providing education and training for cord blood banking personnel. The chair of the planning committee for the scientific sessions was Colleen Delaney, MD, MSc, of the Fred Hutchinson Cancer Research Center and Nohla Therapeutics, and the chair of the technical sessions was Sharon Miller, MT(ASCP), CHS(ABHI), of the University of Colorado Cord Blood Bank. The Presidential Session began with an inspiring talk by Jeremy Sugarman, MD, MPH, director of the Berman Institute of Bioethics at Johns Hopkins University. Joining in a follow on discussion of novel regulatory pathways for approvals of cell therapy and regenerative medicine products were Peter Marks, director of the FDA Center for Biologics Evaluation and Research, Janet Marchibroda of the Bipartisan Policy Center, and Marc Scheineson of the law firm Alston & Bird. In another session, patients told moving stories about how cord blood transplants saved their lives. In the final session, a panel of experts provided “what if” forecasts for the future of cord blood therapies. In addition to the scientific and technical sessions and opportunities to network, attendees enjoyed mild weather and an oceanfront venue in the storied South Beach neighborhood of Miami Beach. 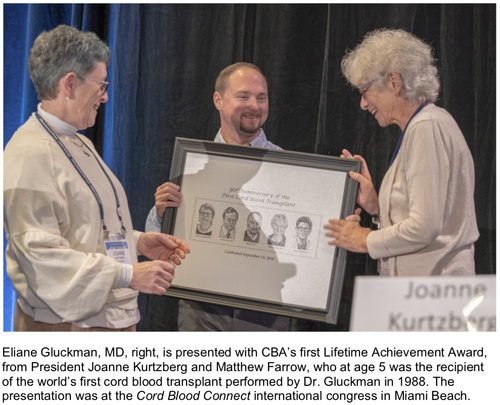 CBA leaders announced that next year, Cord Blood Connect will return to Loews Miami Beach Hotel on Sept. 13-15, 2019, with pre-conference programs and workshops on Sept. 12. Early registration will open in January.